Provided it’s an option, the safest way for any animal to fly is in the cabin as carry-on luggage. Too bad only service dogs and animals small enough to fit beneath the seat are allowed. Undeniably, flying your pets in the hold is a more dangerous option. The airlines have tightened regulations substantially to remove as much potential for danger as possible and when you read the regulations and complete the paperwork, you’ll understand their precautions. For example, they will not fly animals if the origin or destination will be outside of a 45 to 85 degree Fahrenheit range. 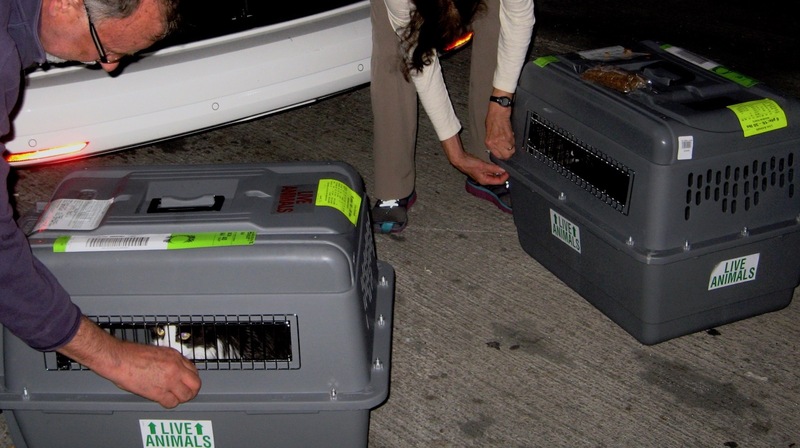 We flew our pets in cargo because, according to American Airlines, we had no other option. The American Airlines website says you can check up to two pets per traveler. The cost is very reasonable – $200 per pet. However, they take pets as checked baggage on a first come, first serve policy. There is no guarantee. I made numerous phone calls to customer service to try to find out the maximum number of animals they would take on a flight but I never got a direct answer. I wanted to know what kind of risk I was taking. Was three the maximum and I show up with five? Two of the representatives forwarded my call to cargo and that’s when I learned about a point system. According to one cargo representative, the weight of each animal and their kennel is assigned a certain number of points. I didn’t have my exact weights figured out but the cargo representative estimated that I might need about 45 points for my 5 pets. I was told my flight could handle 69 points. It was then that the realization of not having a reservation sunk in and I decided to book my animal transport as cargo. The cost was substantially more (instead of $1,000, I paid $4,200) and a reservation is only available 10 days out. I reconciled myself to this decision by reminding myself that if they were children we would be buying them a ticket. This was no different, except that human kids don’t get jammed into the hold. Whether a pet travels as checked baggage or cargo, they fly in the same place in the aircraft and the regulations are the same. If our pets had traveled as checked bags, we could have checked them in at the airport and collected them right at the airport when we arrived at our destination. Our experience with animal transportation via cargo was less than satisfactory at both ends. Not to mention many extra delays. We were told to be at AA Cargo 4 hours before the flight. Naturally, we arrived an hour earlier. I have to say, cargo areas are not welcoming places. There are bays for trucks, forklifts, and cargo but no place for conducting business. It took several inquiries to get us to a nondescript sliding window and caged entrance. Even though we had a reservation and air waybill confirmation number, it didn’t seem like they were prepared for us. The personnel asked to see our booking reservation, EU health certificate, and ID before giving us more paperwork to fill out and attach to the kennels. Apparently, no one at AA Cargo had ever seen cat breeds listed as Domestic Short Hair (DMS) and Domestic Medium Hair (DMH) even though this terminology for mixed breeds is so common it was signed off by the veterinarian and the USDA on the EU Health Certificate. It took an examination of each cat by several supervisors and managers to get us past this issue. I thought we were going to have to make up some fake breed names. American Airlines will not fly any snub-nosed animals and on the cat side this includes Burmese, Persian, Himalayan, or Exotic Short Hair. The list of dogs they will not fly is even longer, however, we skirted that issue for our dog by submitting a required photo at the time I made the reservation. Once they signed off on our mixed breed cats, they gave us zip ties and asked us to affix them to the doors and corners of each kennel. No more potty breaks. Once done, we watched the staff squabble about whether the kennel corners were really necessary. I was afraid it was going to be like the breed issue and require several layers of management to weigh in, but it soon passed. Everyone was happy with the excess except for the woman who lost her entire stock of zip ties. The next step was for us to place the kennels on their scale. Up to this point no money had exchanged hands for this reservation. The final cost was determined by this weight. The 45 point estimate I was given over the phone ended up being right on the money. We had three different kennel sizes. The medium kennel was 6 points. The intermediate kennel was 10 points and the large kennel was 13 points. All together we had 45 points for a cost of $4,100.00. I could have reduced my cost by 8 points if I had put all four cats into medium kennels but I originally purchased two intermediate kennels mistakenly thinking I could fly two cats together. Two animals can fly in the same kennel but only if they are the same species, under 6 months old and under 20 pounds total. I missed that fine print, our cats are 15 and 16 years old, and it cost me! Many Different People at American Airlines’ Cargo Information misinformed us in many different ways. We probably did not need to use cargo and incur more than $4000 in charges. In hindsight, booking in cargo may also have been unnecessary since it appears I was given incorrect information over the phone. Based on the number of phone calls and confusing answers I am not surprised. During the cargo experience I learned that a Boeing 737 can handle 69 points. We were on a Boeing 787 which could handle 198 points. That’s a lot of animals. I imagine we would not have been bumped. With the paperwork completed, our animals fed and watered and their kennels prepared, it was time to say goodbye until Barcelona. When we checked in at our gate, Jamie asked the gate agent to let us know when our pets were boarded. He was called up to the counter and given an affirmative shortly before we boarded. Oh how nice it would have been to pick up our pets with our bags, rent our car and drive to Valencia. Instead, we had yet another cargo experience ahead of us when we arrived in Barcelona. That’s why you really need to read our post on mastering the EU Health Certificate Process. Fortunately, the intercontinentail air transport experience is behind us and we are all happly settled in Valencia.